YouTrack 2.2 Christmas Edition Is Out! Prettify — Code Highlighting. Allows you to make the code inserted into issue descriptions or comments readable — by highlighting it. OpenSearch Support. Now you can type your search query right in the address bar (in Google Chrome) or in the search bar (in other browsers) and navigate straight to your search results! Christmas Tricks. We’ve sprinkled your YouTrack installation with small, unobtrusive Christmas ‘tricks’. We won’t say a word more… download YouTrack 2.2 and find them all! To get more information about brand new features, visit What’s New. 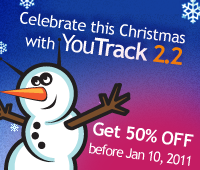 By the way, you can still get 50% OFF on any YouTrack edition before January 10, 2011.